Baseball, apple pie and Chevrolet are all symbols of things that are great about America. This iconic automobile brand has been popular for as long as anyone can remember. Chevrolet has continued to win over their customers from the first Classic Six in 1912 to the Volt. The Chevrolet car brochures below cover a wide range of vehicles and many years of this iconic automobile line. Two partners, Louis Chevrolet race car driver and William C. Durant formerly of General Motors formed the Chevrolet Motor Car Company in 1911. The first vehicle offered by the newly founded car company was the Classic Six in 1912. The Classic Six was a five-passenger sedan that was ahead of its time and could easily hit 65 miles per hour. However real production by Chevrolet didn’t actually start until 1913. We are all familiar with the Chevrolet logo commonly called the bow-tie, but it wasn’t adopted as the official logo until 1914. The story is that Charles Durant stayed in a Paris hotel room and the wallpaper inspired him to design the logo we know today. Basically, it is the same logo seen today in Chevrolet car brochures. In a few short years, Chevrolet was producing cars that were selling and the public was buying. 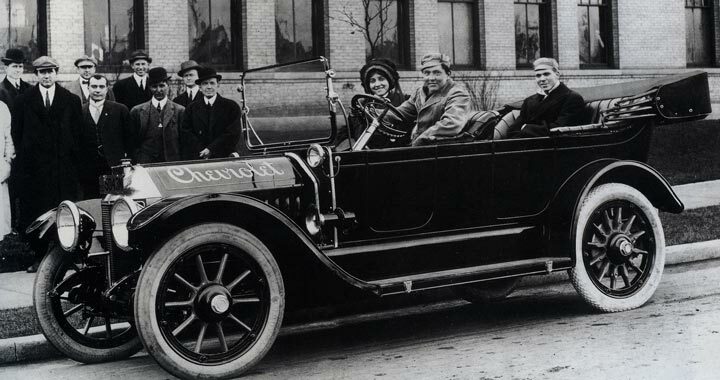 This success and the profitability of the company allow Durant to purchase enough shares of General Motors to gain control on the company in 1918. Chevrolet was then brought into the General Motors fold as a stand-alone division. In the middle of the 1920s Chevrolet became the largest division of GM and by 1927 Chevrolet passed up Ford by selling more than a million vehicles. For the next few decades, Chevrolet built a following that continued to grow as they offered affordable sedans, coupes and pick-up trucks to the American consumer. They continued to bring bigger and better improvements to their vehicles. One such improvement was the independent front suspension, which was a blessing considering the condition of the roads in the 1930s and 40s. Chevrolet continued to grow and prosper by becoming the car of choice for many Americans that couldn’t afford luxury automobiles. However, Chevrolet continued to forge ahead and offer unheard of options and amenities for an entry-level car such as a V-8 engine, power, windows, power brakes, air conditioning and power steering in their sales brochures. The mid 50’s is when the well know Chevrolet Bel Air was introduced and the first Corvette, Chevrolet’s sports car. The Bel Air was offered in a sedan, coupe, wagon and a convertible, which quickly became a popular choice among car buyers. Even today the 1957 Chevy Bel Air is a highly sought after the automobile. I wish I had the original Chevrolet car brochures for that car. Chevrolet charged into the 1960s with popular vehicles like the Corvair with independent suspension and let us not forget about the muscle cars like the compact Nova, Chevelle, and Camaro, which rivaled the popular Ford Mustang of that time. Even the Chevrolet car brochures were amazing. In fact, the Camaro was so popular that in 1967 when it was introduced the Camaro accounted for 10% of Chevrolet’s sales. By the time the 1970s rolled around the automobile market was changing. Fuel economy was starting to become important and there were more and more foreign automakers coming to the U.S. market. This is when Chevrolet introduced cars like the Chevette and Vega for those that wanted the better fuel economy and lower prices. Which brings us into the 1980s when they introduced the cavalier to compete with brands like Honda, Toyota, and Nissan. On the other end of the spectrum trucks and SUVs were becoming popular. Even today the Chevrolet trucks are always among the top 5 best selling vehicles year after year. Check about the Chevrolet car brochures and truck offerings below for the wide offering of trucks and SUVs. Chevrolet continued to focus on the popular vehicles like the trucks and SUVs and the sports cars. The Corvette was reworked and offered trim levels like the ZR1 and the Z06 for bigger, better, faster and more. They also reintroduced Impala SS and in 2010 the Camaro came back to the fold. You find that Chevy car brochures and sales literature below. GM and Chevrolet had some problems when the recession of 2008-2009 hit the automobile industry very hard. General Motors filed bankruptcy and restructured with help from the U.S. federal government. GM and Chevrolet was comeback strong and continued to forge ahead and even grow as you see in the Chevrolet car brochures below. Today Chevrolet is a force to be reckoned with in the auto industry. They continue to offer vehicles for today and tomorrow with models like the Chevrolet Volt all-electric car and the Cruze, which has been very popular for a reasonable price. Chevy has wide range vehicles to handle practically any need or want as you can see from the Chevrolet car brochures below that are available for download in PDF format.